The beauty of these pent Owlesbury modern garden rooms radiates from the large amount of glass which allows natural light to flow into the building. Situated on three sides of the office the glass in nearly full length and this clearly shows the modern aspect of this building. As standard, all the glass is toughened for strength and safety and this Owlesbury pent garden office is solidly constructed from the top quality redwood deal which has been pressure treated against rotting for long life. With a choice of three claddings, you can select the best option for YOU. No cheap, inferior whitewood is used as quality is the middle name of this office. Surely these garden rooms need considering for their looks as well as strength. Besides the high-quality timber used and the superb toughened glass you will find that attention to detail is second to none. Included as standard, and I don’t know of any other garden rooms which include this, there are vents in the soffits (the undersides of the roofs) which allows a flow of natural air into the building. The five lever lock on the doors is backed up with brass handles and hinges with an option for a black antique. No cheap plated ironwork on these Owlesbury garden offices. Besides these features, you can choose from plywood or vapour paper lining or even add in the full lining and insulated option. Solid stained T&G roofs and covered with a top quality heavy duty roofing felt for long life. Further options for felt tiles if you choose. Added together these garden offices certainly make a statement. It’s important that your new garden room has the right framework to ensure the best strength and on the Owlesbury this is standard. Sturdy 75x38mm framing is used on all models and this is further strengthened by the use of internal diagonal bracing in ALL corners. This enhanced rigid framework is the key to the great strength of these Owlesbury garden rooms. The extra thick T&G floor is pressure treated as well as standard and this ensures a very long life for your new garden office. Your garden and your needs are often unique to you and this is where it’s important that you can buy a garden home office to suit you. Whereas there is a range of set sizes of garden rooms to choose from but you can have more or less any size to suit you. If you would like a partition, a side door, extra doors or windows then that is no problem. The only restricting criteria are that your new garden office needs to be square or rectangular. Other than that there should be no problem. Even if you not sure then please ask – we don’t bite – and we will do all we can to help. To ensure the best use of your new garden room it’s advisable to add the optional fully insulated option and double glazing to your building. By doing this so this will make it a lot easier to keep warm in the winter and cooler in the summer (which not many people think about). This will ensure a pleasant working environment for you and combined with a large amount of natural light flooding in will make work a doddle. You can also be certain that whatever ‘Mother Nature’ gets up to you will be as ‘snug as a bug in a rug’. Very satisfying! In this modern day it very easy to take a look at a bright colour brochure or be enchanted with a flashy web site. However, you can not beat physically touching a building before you make a purchase and being all touchy-feely. This way you can be sure you are making the right choice and won’t be disappointed when your new garden office from the web site turns up and is not what you expected. Even if you don’t visit – the very fact a supplier has a display site – should give you confidence in them. Visit our large garden rooms display site between Woking, Farnham & Guildford, Surrey which you can examples of the Platinum garden rooms for you to inspect and feel. This will ensure you are making an informed choice and not relying on something in cyberspace where you can’t be sure. You also should consider checking out independent feedback such as this site to get a feel for what earlier customers think. Can be enlightening. Size: These garden office are available in sizes from 1.5m x 2.1m (5′ x 7′) – up to 3.6 x 3.6m (12′ x 12′) as standard, but larger and made to measure garden rooms can be made so please ask if you need any other size or layout. Cladding: 19mm (15-16mm finished thickness) pressure treated T&G, 22mm (20mm finished thickness) T&G Loglap or Traditional rebated – overlap weatherboard cladding – 23mm – 6mm thickness. – (Redwood deal not the cheaper inferior whitewood) Options to line with plywood and bitumen paper between the home office framing and cladding for extra strength and damp-proofness. Framing: These Owlesbury modern home garden rooms have a superb 75x35mm (2¾” x 1½” nominal) on all buildings. Diagonal bracing in ALL corners for extra stability and strength. Thicker in corners. Roofs: 16mm (12mm finished thickness) T & G stained timber covered with heavy duty green mineral felt. Options for a Onduline, Ondulvilla tile effect, Novislate or for felt shingle tiles. Attractive 12in reverse roof overhang as standard. This is in addition to the overall size of the building so an 6×8 building would have a roof 6×9. 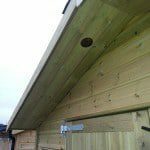 (NO chipboard, plywood, OSB, sterling board or sheet materials as these are unsuitable for outdoor use despite what some garden room or office companies say) Vents added to the soffits (underside) of the roof to allow for free flow of air. Floors: The extra strong heavy duty floor is made from 19mm (15mm finished size) T&G timber boards as standard and is set on 50 x 50mm (2×2 nominal) pressure impregnated joists for long life. Doors: Double Doors 4′ 0″ wide x 5′ 10″ high (120 x 178cm) on all garden rooms. Toughened glass is standard. Optional for double glazing. Windows: Joinery made 18″ wide x 65″ high (46 x 165cm) windows. Glazed with 4mm toughened glass with option for opening windows. Four (4) windows on each home office. Option for opening windows, extra windows or double glazing. Note there will be no windows alongside the doors on 7ft wide buildings. Height: Lower height 6′ 5″ (195cm) eaves on all home garden rooms which rises to about 2.3m on the high (front side). Option for extra height to suit. Note standard height is below 2.5m to avoid planning permission issues. Treatment: 15 years design life against rotting is standard on these Tanalith pressure treated garden rooms, gives the cladding and timber a long life. Although the timber is protected against rotting it’s important that you apply a coat of waterproof treatment within 3 months of delivery to ensure the fullest life for your new building. Erection: These Owlesbury wooden pent garden rooms are erected without charge in your garden. All you need to provide is a solid level concrete or paving slab base or timber decked area. We do have an option for building a timber subframe (some areas) for you. The Owlesbury garden office is assembled using coach screws for ease of taking it down again if you decide to move. Ask about discount for delivery only (self assembly). Insulation: We have an option to line and insulate these buildings and garden rooms for all year round use. It is recommended that you line and insulate them, to keep them cool in summer and warmer in winter if you intend to work all year round inside them. Support UK: You can support our British workers as these Platinum Garden Rooms are made in the UK by experienced craftsmen at a family firm. Optional Extras: Various options such as double doors, extra windows, 3¾” x 1¾” framing, lining & insulation, guttering, double glazing, extra height. Sizes: Unless specified as finished size then sizes quoted are before machining which reduces the size quoted by about 3mm. Overall sizes of the Owlesbury Modern Garden Home Office are nominal METRIC sizes which are slightly smaller than imperial. Beware of other garden rooms with before machining measurements. Always check if not clarified. Delivery: Most of England has free delivery with the exception of Cornwall and Devon. Also Dorset, Somerset, Norfolk, Suffolk and deepest Kent. Cost for delivery to these areas varies according to your location.